We booked a 14 day travel pass with Baz Bus which allowed us two weeks to reach our goal. Our aim was to see as much wildlife and birdlife on our travels which South Africa is famous for. We started off in Cape Town with the Baz Bus Cape Peninsula Day Tour. We automatically qualified for a R50 off the day tour as we had a Baz Bus ticket…a great bonus!!! What an amazing start to the day, the scenery was spectacular; we saw hundreds of lazy seals on our on cruise to Seal Island from Hout Bay and quirky penguins at Boulders Beach and this all in one morning!!! 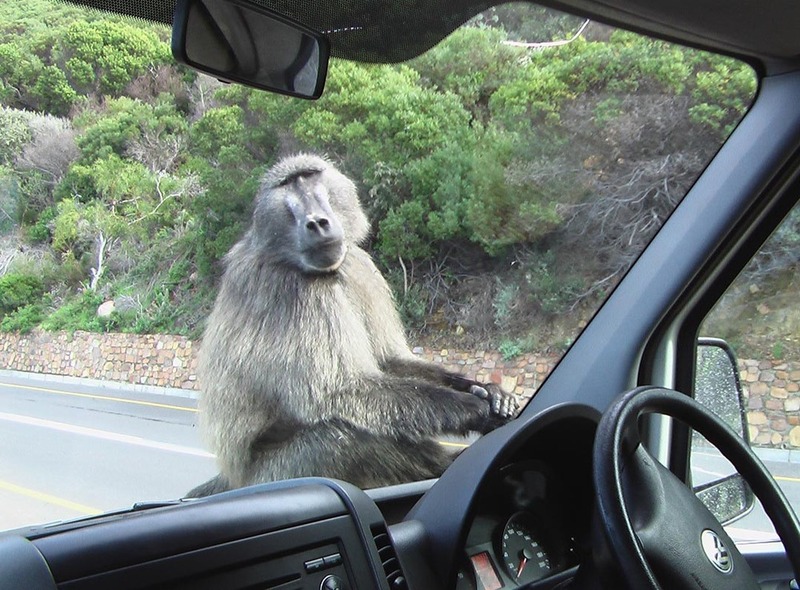 The encounter with three hungry baboons was frightening and a cheeky one even jumped on the bonnet of the bus. Advice from one traveller to another, do not feed the baboons. Over many years of being fed by tourists they are now accustomed to being fed and can be aggressive if their demands are not met!!! Otherwise they are very entertaining and intelligent as you can see in the picture below. As we drove through the Cape Point Nature Reserve we were amazed at the scenery, beaches and hiking trails. A definite must see if you in Cape Town. We stepped up the pace with a 6km cycle to the picnic site. An exhilarating ride with gale force wind blowing …what an adventure and now we were ready for lunch!!! After lunch we spent the afternoon hiking and spotted zebra, eland and ostriches all gracefully strolling about. Photo opportunities at every turn!!! The next day we started our 14 day journey to Johannesburg and our first stop was Hermanus. During whale season we were told you can watch massive whales on their annual migration. As the “Whale Gods” were with us and it is currently whale season (June-November) we spent the afternoon sipping cocktails while watching Southern Right whales playfully frolicking in the ocean. Hermanus is best land based whale watching spot in South Africa. It was a spectacular experience. The next day we booked a Shark Cage Dive tour and got a great deal with a local operator. In the space of only three days I got to see the cutest penguins, magnificent whales and had an encounter with 10 Great White Sharks. The marine biologist on the boat mentioned that the past week they sighted on average 5-12 sharks daily. This trip can only get better! Our second stop was the Garden Route Game Lodge where we spent the night and we had two game drives booked. Baz Bus drops off passengers just in time to check into the luxurious accommodation and to explore the area before the sunset drive. We saw a baby cub born two weeks ago and the lioness was fiercely protecting her cub. We experienced a magnificent sunset while watching Springbok, Giraffe and Elephants go by. An early rise the next morning to spot more wildlife. I got to see the big five – Rhino, Lion, Leopard, and Elephant & Buffalo. What more could we ask for!!! Third stop, off to Oudtshoorn. As Baz Bus does not drop off directly in Oudsthoorn we arranged a shuttle service with the hostel which then meets the bus. My next adventure led me to ride an ostrich all of 5 seconds but it was great fun and after that Marlen went cage diving with crocodiles at the crocodile farm. Oh my frayed nerves…. way more adventure than I’m used to, however Marlen is known to be the adrenalin junkie. Off to Plettenberg Bay and we spent three nights here and here we wanted to see as many dolphins as possible so booked some tours to see these amazing creatures. The first day out on sea, we spotted seals rather than dolphins and enjoyed the stunning ocean waves. The second day we had better luck, we sighted a pod of 9 dolphins. It was spectacular. Definitely another wow factor of the trip, the third day we just spent lazing on the beach. The next few days we stopped off in different towns hiking and exploring the beautiful Garden Route and finally making our way to Port Elizabeth where we booked a full day Addo Elephant Park Tour. It is just breathtaking to see these gentle giants roaming in their natural habitat. This trip definitely exceeded my expectation. After Port Elizabeth, we headed to Johannesburg and spent our last days relaxing before heading home. I plan to come back next year as I chatted to some passengers on the bus who booked the African Wildlife safari with Baz Bus and highly recommended it! !